Esther Couturier at the orphanage in Zimbabwe. This summer a life long dream recently turned into reality for me when I was able to travel to Zimbabwe, Africa. Since I was 12, God has been cultivating a desire in me to someday live in Zimbabwe. I have continued to believe that despite my circumstances, and of not knowing how it would happen, that one day God would provide a way for me to travel to Zimbabwe. God orchestrated this through my meeting a young man, in my church, who was visiting from Zimbabwe last summer. He invited me to stay with his family. 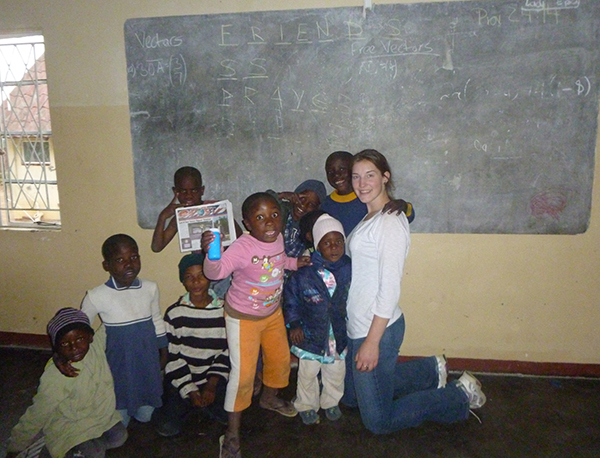 I was able to travel to Zimbabwe on May 31 and stayed for eight weeks! It was the best eight weeks of my life, so far. While I was there, I took the Post on many adventures, from reading to children in an orphanage, decorating cupcakes with foster children, helping feed the elderly and visiting a Government Hospital. We also visited Gonarezhou National Park, where we saw hippos and rhinos. At a game reserve we rode elephants and petted a lion. We also experienced Jackal hunting, hiking Victoria Falls, and white water rafting on the Zambezi. We also toured a butchery and shopped at the flea markets. My favorite part of the trip was staying on a farm. Besides enjoying the absolute beauty of the place, I also enjoyed vaccinating mombes (the word for cows in Shona—Zimbabwe’s native language), riding motorbikes, and teaching at the school. I helped teach math to eight-year-old children and English to 14-year olds. I also climbed gomos (mountainous terrain), and I talked with many of the employees, who helped teach me Shona. Everyone I met along the way was exceptionally nice. The families I stayed with are very relational and enjoy talking over tea and rusks. I really loved just listening to everyone’s stories. Some tell of just the hardships in the past, others tell of hope for restoration, while most tell of both. There are so many different aspects and cultures in Zimbabwe. Life is different there. Even though there are power outages daily, lack of variety in food and supplies, potholes galore along with insane driving, and a corrupt government, I loved every bit of it! God answers prayers and He fulfills His promises. He is a God who has a plan for everyone’s life, because He formed us and loves us. I know without a doubt I will return to Zimbabwe. The vision God has placed in my heart is not yet fully fulfilled. Thank you to everyone who supported me, prayed for me and encouraged me. I hope to continue to share this journey. I was not able to, or had forgotten take photos with the Post everywhere I went, but it was in my back pack everywhere I traveled. Thanks, Esther, for taking us with you on your adventure!